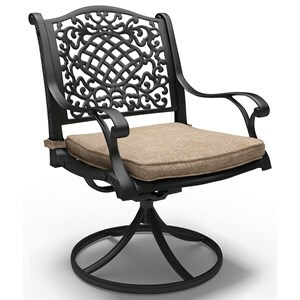 Dine in style on a beautiful day with this outdoor cushioned swivel chair. Featuring an intricate metal scroll design on the back and a smooth 360-degree swivel motion, this is exactly what your outdoor space needs. With a rust-proof cast aluminum frame and the durable high-performance Nuvella™ fabric on the cushion, this chair is made to withstand all the elements - rain or shine. The Rose View Outdoor Swivel Chair with Cushion by Signature Design by Ashley at Value City Furniture in the New Jersey, NJ, Staten Island, Hoboken area. Product availability may vary. Contact us for the most current availability on this product. Transform your outdoor space into a wonderful place for your family and friends to dine on a beautiful day with this collection of outdoor seating. Boasting both style and durability, these pieces are made to withstand the elements while maintaining their elegant appearance. Features such as delicate scroll designs on the back of the chairs, high-performance Nuvella™ fabric on the cushions, and rust-free cast aluminum construction give you the perfect excuse to spend more time outdoors. The Rose View collection is a great option if you are looking for Transitional Outdoor Furniture in the New Jersey, NJ, Staten Island, Hoboken area. Browse other items in the Rose View collection from Value City Furniture in the New Jersey, NJ, Staten Island, Hoboken area.